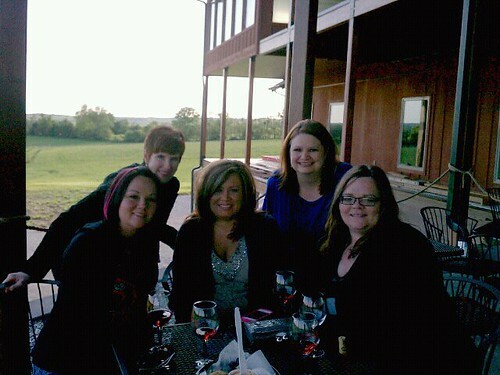 Thanks to my wonderful friend Christina, the girls (Jennifer, Christina, Lesley, Amanda and I) had a weekend planned in Ste. Genevieve, Missouri, which is about 2 to 2 1/2 hours north of where we live. We started our trip bright and early at 8:30 a.m. Since we knew we’d be eating breakfast on the road, we were all good and hungry by the time we stopped at Cracker Barrel in Cape Girardeau. After egg sandwiches and pancakes and biscuits and the beginning of much laughter, we were ready to tackle the day. We planned on taking the Route Du Vin, which is a tour of six local wineries in the Ste. Genevieve area. We arrived in Ste. Genevieve around 11 a.m. and alighted upon our first stop: The Ste. Genevieve Winery. There, we purchased our tickets for the tour and grabbed our first glass, a dry white wine that none of us didn’t really care much for. However, there was a lemon drink that was pretty awesome. We had some mediocre chicken salad sandwiches and then got busy with the tastings. I, personally, liked the raspberry wine the best, but the general consensus was that the blackberry was the favorite. That was one winery down and five more to go. But we discovered quickly that these wineries were miles and miles away from each other. So the tour started to prove to be a challenge. Our second winery was at The Cave Winery, though, which featured… well… a cave. The wine there was actually quite good (we all agreed), but we skipped the tasting as there was a charge for it (even with the tour – what kind of sense does that make?). There was also some very good feta dip and pita chips, though. 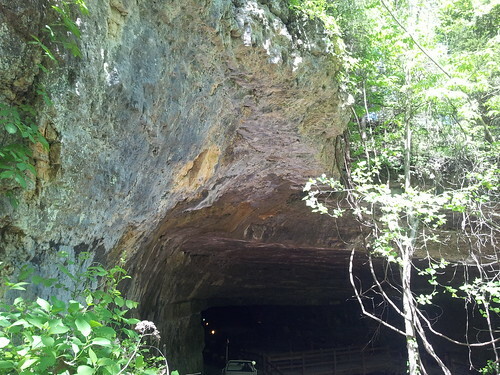 We walked down to the cave and did a little sightseeing. It was actually pretty neat. So two wineries down and four to go. We made it to the third, Chaumette, and at that point had realized that the gas tank was sitting on “E” and had been for some time. Christina asked about gas stations and only received laughter in response. We were literally IN THE MIDDLE OF NOWHERE and obviously not close to civilization. But we drank our glass of wine there, as well, and decided we would figure it out. I was the only one that liked the red that we were served – I found it very close to a merlot and I love merlot. The tilapia, though? It was not all that great and we were in agreement on that. Again, this winery also charged for tastings, so we skipped out on that. And we knew that we absolutely had to have gas. And our only hope? The outdated GPS we were using. It found a route for us, nearly 20 minutes away and we were praying that somehow we could make it that far. So we began to drive. The GPS told us to turn. On a dirt road. We followed, thinking that the GPS knew what it was doing. And then we came upon a creek. In the middle of the road. Which sort of stopped and re-appeared on the other side of the creek. It was shallow and the floor of it was smooth, so we all decided that we’d just keep driving and went across the creek. ACROSS THE CREEK. THROUGH THE WATER. We were in a truck, so why not, right? So we kept following the route the GPS was taking us. And then had to stop again. Because the creek re-appeared in front of us. But again, we saw that it was shallow and smooth, so we drove through that. After the road began to narrow and became not so much a road as a sort of path, we were starting to freak out. We had also lost all cell phone service and I swore I began to hear the banjos playing in the background. I’m pretty sure I said “We’re all going to die!” a few times. But we kept on driving. Because we were GOING to get to that darn gas station. But then the road ended completely. And there was nothing but creek. The floor of it looked smooth up until the end, which seemed to get deeper. Not wanting to turn around because we actually saw a real road with cars driving on it adjacent to said creek, we thought we’d survey the scene. Christina stripped off her shoes and rolled up her pants and waded in. I thought I’d skip that and try to scope things out from the bank of the creek. 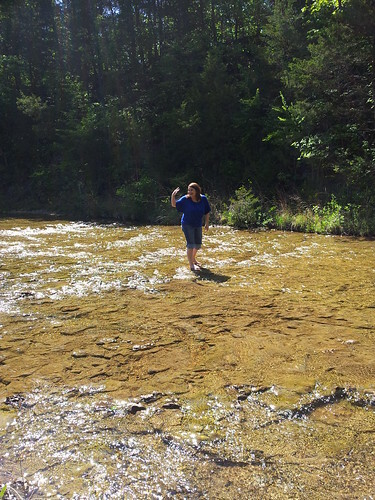 I got about halfway down the creek before I lost my nerve (and ran out of ground to stand on), but we had then determined that the creek might end up to be too deep to continue driving through. On the way back from my little jaunt, I ended up with extremely muddy sneakers (fortunately, I had an extra pair to change into) and we were all beginning to freak out completely. Very carefully, we turned around, terrified we were going to get stuck or run out of gas and that the natives would come out with their pitchforks and have us for dinner. But somehow, we survived the trek back to the real road and found our way towards the highway, where we knew we’d find gas. And now we know just how far that truck can drive while it’s on “E.” And fortunately for us, it’s a lot further than we would have expected. 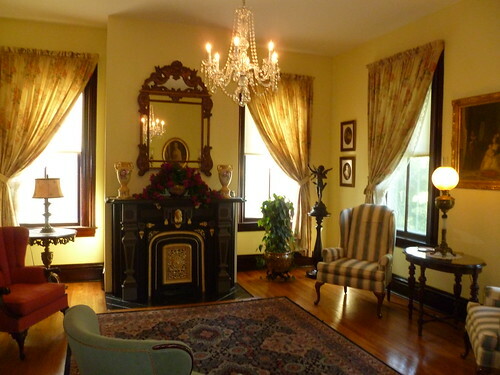 At the gas station, we decided we were done with the off-road adventures and decided to go check into our Bed & Breakfast instead, White Cliff Manor. There, things began to improve, but I’ll admit, I pretty much laughed the whole adventure off. It was fun! And funny! And we didn’t die and we didn’t run out of gas. Things were going to be okay. White Cliff Manor was beautiful. It’s an old house sitting on old plantation ground and is absolutely lovely. The owner, Brian, welcomed us as if we were family returning home. We were shown our rooms and was asked if we had dinner reservations. I’m pretty sure we hadn’t thought we’d need reservations but there are few actual restaurants in the area. And EVERYTHING is so spread out. I don’t know how those people can live there and not go insane. But Brian was resourceful and called around and got us in at a place called Weingarten, which was another winery. Our reservations were not until 7:30 p.m., but we headed out there early. This turned out to be our favorite winery. It was fairly new on some beautiful grounds in a wide open space and the people there were absolutely fantastic. We had some bread and a sun dried tomato spread, along with what turned out to be three bottles of blackberry wine. The trip was officially a success. And then we had dinner. Which consisted of a salad with some of the best dressing I’ve ever tasted. But the best part was the steak we had. I have never had steak tender enough to be cut with just a fork, but this steak was. And it tastes like absolute heaven. Between that, and the rolls, and the baked potato and the truffles we were given for dessert, we were good and stuffed at the end of the evening. Because of both a wedding and prom going on at the winery, we were given our very own private dining room and were treated like royalty. Even the owner of the place came out and spoke with us and apologized for the late seating for dinner. I will return here someday. Just for that steak. Our moods were lifted on the ride home and at some point, we were laughing so hard that I was, personally, in pain. I couldn’t catch my breath, but we were just giggling and cutting up and having a pretty darn good time. We returned to White Cliff Manor and retired for the evening. I had another dream that will end up being part of my second novel. We woke up and had the best coffee on the planet. Apparently, Brian has a French press and grinds his own beans. It was DIVINE. But then at 9 a.m., the breakfast bell sounded. We gathered around the table with two couples and were served these amazing sticky buns with walnuts with a wonderful quiche, all homemade. We had orange juice, as well, but Brian also broke out a bottle of champagne (I had two glasses). At that point, I decided I wanted to live here forever. But we had to come home sometime, didn’t we? 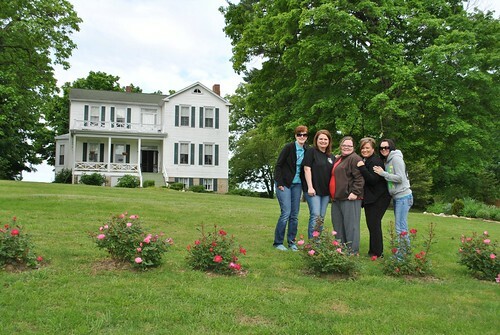 We had a small photo session in front of the manor, taking photos with Brian and all of us, and then checked out. We decided we absolutely HAD to have the candle that Brian was using at the manor, so drove back into Ste. Genevieve and did a little shopping, checking out some antiques shops, gift shops and the candle store (we each purchased one of those candles – it smells like home and is appropriately called “Home Again”). With purchases in hand, we drove home, making a stop in Cape Girardeau, where we were seriously disappointed that My Daddy’s Cheesecake was closed on Sundays. But we settled for Panera bread. After lunch, we came home.